The tabs look rough but they can be trimmed once the cover has dried. Both handpresses have been in constant use since the last post and they are both running extremely well with just a little routine maintenance. I still need to get a handle cast for the 1865 Albion but it certainly works as it is. My next job is to recover both tympans - this time, I think, with cloth as the strong brown paper has ripped in a few places. 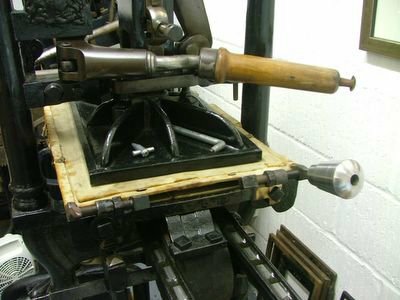 After removing the tympan, I can undo the turning tapes, carefully lift the bed of the press off the rails and then remove the turning mechanism. The rails easily pulled back into position and I could tighten them some more. There is a balance to be struck here - I wanted the rails to be tight but I don't like to overtighten these Victorian bolts. If the rail still moves a little over the next few months, I can always repeat this procedure. I ran a thin line of oil along the rails before lifting the bed back into place. I am always wary of this as my foot is still marked from breaking the fall of this piece on the first day that I saw the press (see July 2005). The tapes were then reconnected to the bed. Experienced handpress users will note that, in my haste, I had not threaded them over the cross bar of the rails - I had to do this again after realising that the bed would not wind in. Here is the "after" photograph to compare with the first. The rails are now back in their proper place. 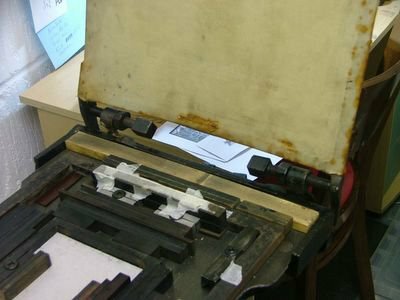 Notice that the platen is slightly askew. This is very common in Albions. Since it does not affect the printing process, I am happy to leave it be. Job Done! The Albion is back in operation and I am covered in oil. Does life get better than this? 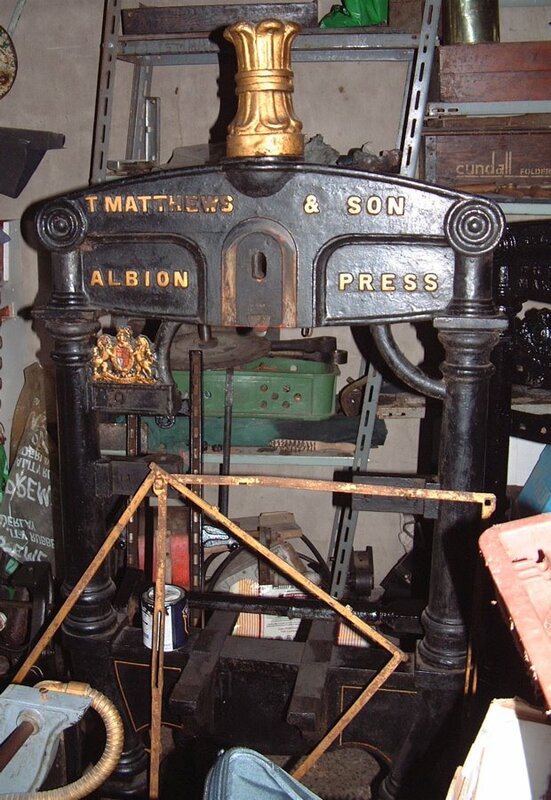 I have rather neglected the large Albion press recently. It was a question of making time to cover the tympan; there was always something else that I had to do. Its such a long time since I posted to this blog. The small Albion is in regular use for day to day printing from engraving blocks. I have made some small improvements which I will highlight soon. In the meantime, I made a short "peepshow" style video of the printing of a bookplate. 1. I am using lots of layers of very thin ink to get the result I want with this block. 2. I use sections cut from clear plastic folders to hold the paper during printing. This is much bigger than my current Albion and the idea is that I can not only edition current large blocks but also plan larger images for the future. 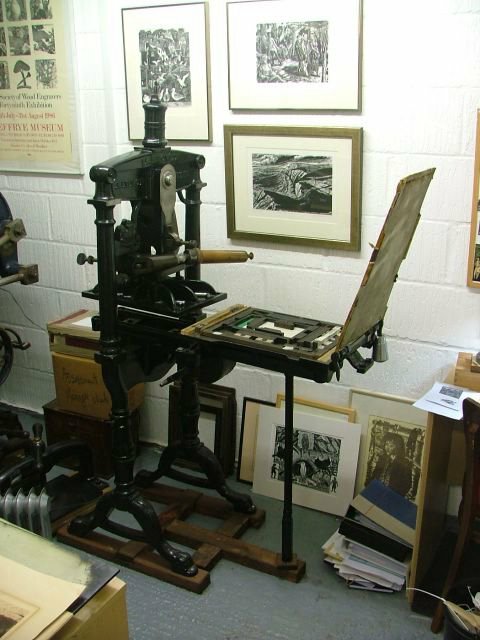 This has all set a flurry of activity; I need to clear space in the studio and also find the money to fund this purchase; thesepresses are not cheap! I will continue to work on the money tomorrow but the current task is to dis-assemble the Arab press to point that it will get through the door. This Herculean task continues tomorrow. 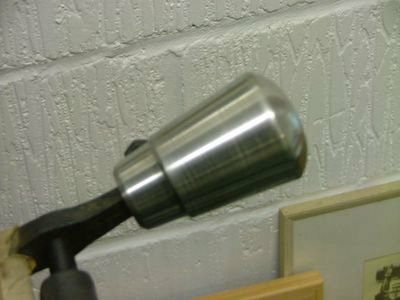 Here are some photos of the press as it stands at the end of October 2005. It is working well but still needs a little work. Here is the press as it stands at the end of October 2005, nearly a year after receiving it. The tympan works, but needs a new cover - and there is a bright new counterweight. Here is another view of the repaired hinge bar. Here is the new metal counterweight. I have decided to keep the bright metal, rather than paint it.